Dr. Evgeny Chugunov has a Ph.D. in Piano Performance (University of Montreal), where he studied with Marc Durand, and a Ph.D. in Music Education (Moscow State Pedagogical University). 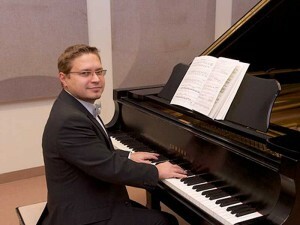 He is currently a piano faculty member at the Department of Music of Lakehead University. Before coming to Canada, he worked as a Lecturer in Methodology and Psychology of Music Education at the Music Faculty of Moscow State Pedagogical University. Upon arrival and the outset of his doctoral studies, he taught Piano Performance at the Faculty of Music of the University of Montreal and at the McGill Conservatory of Music. Dr. Chugunov has been invited to give masterclasses at different international music festivals and schools in Canada, USA, Russia and Italy. He is a member of juries of numerous piano competitions including Cremona International Piano Competition and Crescendo International Music Competition. His students have been awarded prizes in national and international piano competitions. Dr. Chugunov is regularly performing as a concert pianist, both as a soloist and collaborator with different programs in U.S.A, Canada, Russia, Italy and Switzerland. Many of his solo and chamber music recitals were presented in the famous recitals halls such as: Carnegie Weill Recital Hall (New York, 2010), Pollack Hall and Redpath Hall (McGill University, Montreal, 2009, 2006), Salle Claude Champagne (Université de Montréal, 2002-2008), Rachmaninoff Hall of Moscow Conservatory (Russia, 1998), Chapelle Historique du Bon-Pasteur (Montreal, 2010), Live Radio Lac Recital Hall (Geneva, Switzerland, 2000). A sensitive artist and a critically acclaimed pianist he possesses a rare musicality, which unmistakably charms his audiences around the world.